NASA's first Tracking and Relay Data Satellite (TDRS-1) is deployed in space from the space shuttle Challenger in April 1983. NASA's firstdata-relay satellite, which dutifully sent communications between NASAspacecraft and the ground for 27 years, is headed for the retirementhome. The Trackingand Data Relay Satellite (TDRS) 1 relayed telemetry data fromlaunchingrockets back to NASA's Kennedy Space Center in Florida during the early1990s.It later served a vital role relaying communications between theInternationalSpace Station, the Hubble Space Telescope, and other importantspacecraft withground controllers. 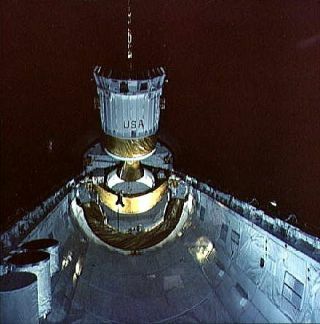 TDRS-1 waslaunched into orbit during space shuttle Challenger's maiden voyage inApril1983. After fiveyears of providing NASA with the ability to communicate with otherspacecraft,the satellite was reassigned to an orbit that closed a dead zone overtheIndian Ocean and connected the South Pole to the North Pole. It continuedto relay signals and voice commands between spacecraft in the NASAcommunications network, but took on the additional job oftransmittinggigabytes of scientific data to university researchers on a dailybasis. Managingincoming data from eight other satellites, TDSR-1 was instrumental intheefforts of the Hubble Space Telescope, the International Space Station,thespace shuttle and the National Science Foundation (NSF), which has runseveral Antarctica-basedprojects. "TDRS-1paved the way for this incredible space communications system," saidBillGerstenmaier, associate administrator for NASA's Space OperationsMissionDirectorate. "The remaining TDRS satellites, and the new satellitesthatwill be online within three years, will carry on these criticalcapabilitiesfor many NASA missions, including science and human spaceflight." In the early1990s, TDSR-1 was the first satellite to support launches from NASA'sKennedySpace Center. In 1999, it assisted in a medical emergency affecting theNSF'sAmundsen-Scott South Pole Station's lone physician. Afflicted withbreastcancer, Dr. Jerri Nielsen successfully performed a self-biopsy andadministeredchemotherapy using the satellite's high speed internet connectivity asa mediumfor telemedicine conferences. Thesatellite made possible the firstInternet connection and live webcast from the North Pole, andthe world'sfirst globally broadcasted television event at the South Pole Station(a newyear's celebration for 2000). South Poleresearch programs supported by TSDR-1 include the IceCube NeutrinoObservatory,and the SouthPole Radio Telescope. NASA shutdown the satellite on June 27 after a two-week process of removing itsfuel andstabilizing its orbit 22,500 miles above Earth. By 2013, twomore satellites will be added to the nation's Tracking and Data RelaySatelliteSystem, according to a statement by NASA.